Bakson Gro Up Drops Review - Ways To Become Taller Bakson Gro Up Drops Review – Does Gro Up Homeopathic Drops Really Work? Find Out Here! Bakson Gro Up Drops Review – Does Gro Up Homeopathic Drops Really Work? Find Out Here! Homeopathy or Homeopathic Medicine is defined as the practice of medicine that covers a holistic and natural approach to the treatment of a disease. It is holistic in that it treats the person in question as a whole rather than concentrating on a diseased part or an already labeled disease. Homeopathy is always described as being natural because its remedies are produced according to the U.S. FDA-recognized Homeopathic Pharmacopoeia of the United States from natural sources, whether vegetable, mineral, or animal in nature. The word Homeopathy, which comes from the Greek, through Latin into English, literally means “like a disease”. This means that the medicine given is like the disease that the person is expressing, in its totality, not like a specific disease category or medical diagnosis. Searching in different internet directories to get some of the homeopathic formulas that are effective, I stumbled over the Bakson Gro Up Drops. 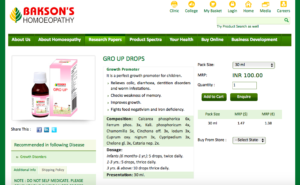 Bakson Gro Up Drops claims to be a powerful homeopathic growth promoter for children. I could find the product’s official website, but the big question here is; will this formula achieve what it claims. Read complete review to find out! What is Bakson Gro Up Drops? 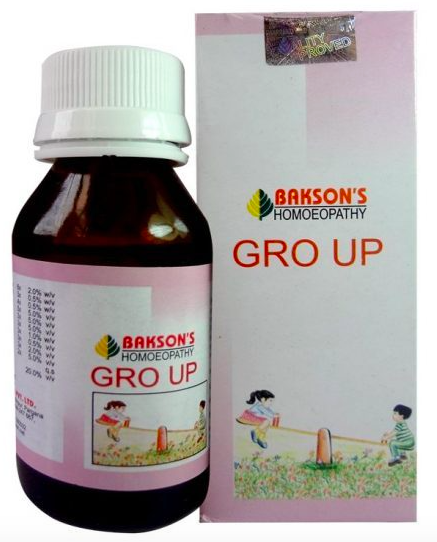 Bakson Gro Up Drops is marketed as a homeopathic growth promoter, which helps children grow at a healthy pace. Other than its ability to cause growth in children, the manufacturer mentions that Gro Up Drops relieves colic, diarrhea, dentition disorder and warm infestation in infants. Additionally, they mention that it is very effective for food negativism, iron deficiency in children as well as for weakness of memory. The manufacturer of this formula states that it is made as a result of thorough practical research as well as successful clinical trials. This direction is in line with the manufacturer’s recommendations! For infants (6 months to 1 year), it should be given 5 drops two (2) times daily. For children (1 year to 3 years), the recommendation is to give 5 drops of the solution three (3) times daily after shaking it. Undoubtedly, healthcare experts somewhat believe in homeopathy. However, manufacturers who have the real formulation of this class are not always easy to get. From the several details about the Gro Up Drops by Bakson, it seems it may live up to its claims. For now, we will have to follow this review to the end as this will serve as a guide for prospective users of this formula. According to the manufacturer’s details, the combined effects of the various ingredients in Bakson Gro Up Drops brings about its growth benefits and others. Calcarea Phosphoric: Helps in the effective assimilation of calcium which in turn strengthens the bones and helps dentition. Ferrum Phosphoricum: This is said to handle cases of anemia, bronchitis, and fever. Kali. Phosphoricum: Useful where there is a loss of weight, which is associated with a nervous temperament. Chamomilla: This is useful in children with a highly irritable temperament. It helps with diarrhea during dentition, attacks of acute abdominal colic accompanied by flatulence. Cinchona off. (china): Known as a remedy for chronic liver disorders and loss of appetite. Lodium: This is indicated in loss of weight in spite of a good diet. It is also useful in cases where the lymph glands are swollen. It addresses chronic constipation. Cuprum oxydatum nigrum: Effective in treating worm infestations. Cypripedium: Helps nervous, edgy, restless and temperamental, children. Chelone g l: This expels round worms and thread worms. Cataria nepta: Helps relieve colic (spasms). Who Is Bakson Gro Up Drops For? 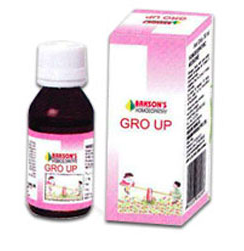 Bakson Gro Up Drops is for children and infants who are defective in growth, hence its growth promoting effect. From the manufacturer’s explanation, it is for children and infants experiencing other conditions such as colic, diarrhea, dentition disorder, warm infestation, food negativism, iron deficiency and weakness of memory. Follow down for the final details! No before and after photos for proof of evidence. Bakson mentions that their growth promoter is formulated after several pieces of research. It promotes to be safe and effective when used as directed. They have several other products in the market and customers can use the product search tab to get the product they want. Bakson Gro Up Drops, according to them are made with the best quality ingredients and each formula batch pass through a strong quality control. Customers can purchase the product online at its official website or through Amazon (www.Amazon.com/Baksons-Homeopathy-Gro-Up-Drops) . The manufacturer can be reached by email. With this review, we have read through the various effects Bakson Gro Up Drop states to achieve. Undoubtedly, they are amongst the leading homeopathic industry in India, but I could not find where previous users of this formula gave some positive reviews. On the other hand, they mention to have done clinical studies with their formulas and there are reports about that on their official website. More so, there is no option of a refund which should have made the formula more reliable. For a fact, people have not started resorting to homeopathic medicine that much. However, I can say that it seems Bakson stands solidly behind all their products. However, why don’t we check out other effective and proven formulas out there who will actually give results in height, which the Super Growth I have used and I got results in height?! Now the Growth Factor Plus, there are many real users who have experience height growth with these Growth Factor Plus pills. Either one should be effective in height growth effects. Feel completely free to drop me some comments, it would be my pleasure to hear them! Hypnosis to Grow Taller by Hyptalk – Complete Review – Is It Worth Giving It a Shot? MUST SEE!